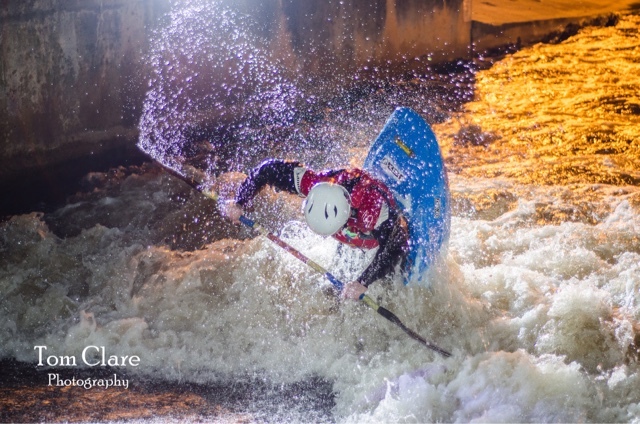 HIGHLIGHTING PADDLE MEDIA ~ Tom Clare Photography | DBP MAGAZINE ONLINE The World's Best Free Whitewater Publication. 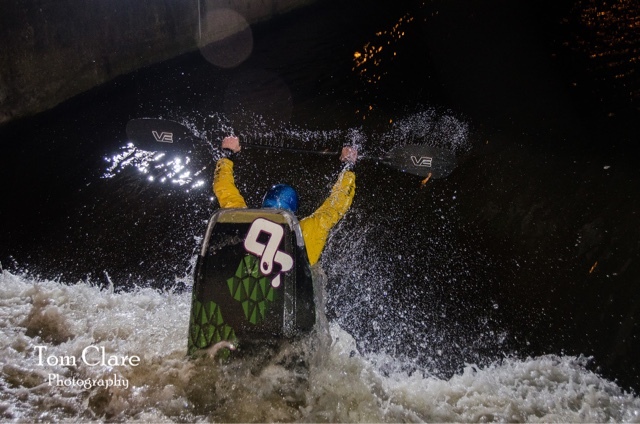 The whitewater course at Nottingham is home to some of the best freestyle paddlers in the UK. One of their favourite play spots is the “Inlet Gate” hole, caused by the flow control gate under the water. 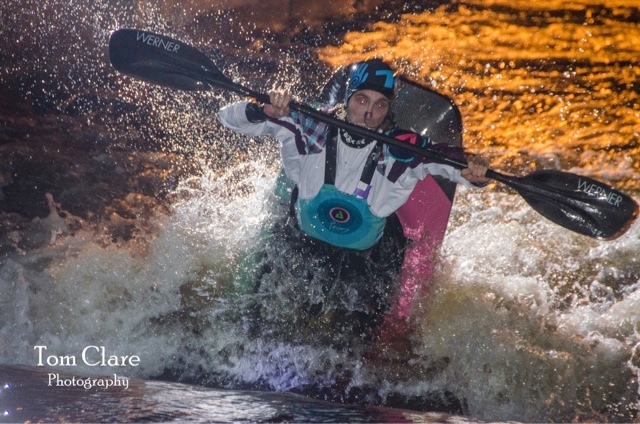 It forms a uniform, deep, powerful feature that remains friendly, and has easy access for coaches (and in my case photographers) to the paddler in the hole. 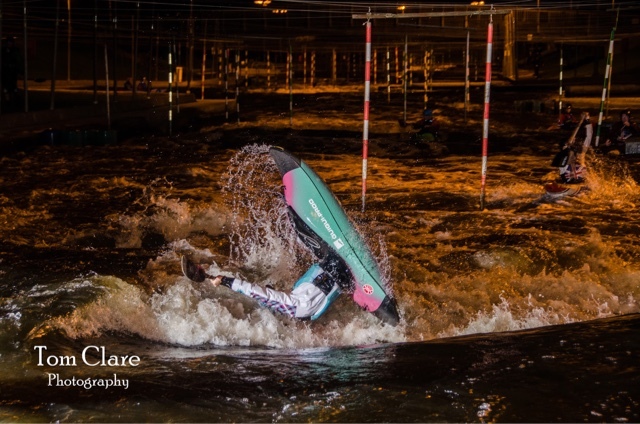 Unlike the rest of the course, which is well floodlit, the gate is fairly dark at night, which allows for some creative lighting to capture unique images of freestyle. 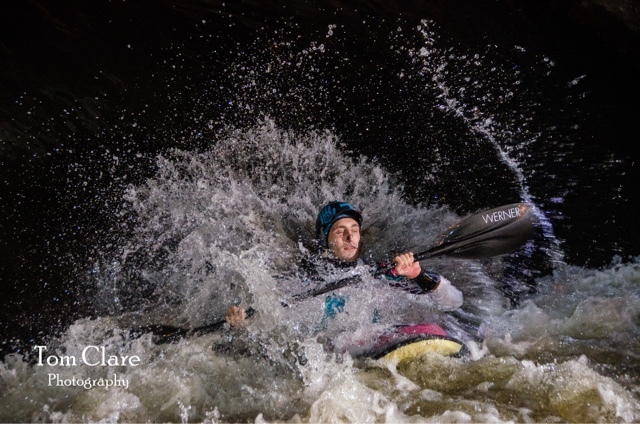 Normally if you are shooting action, especially something as fast moving as freestyle, you have to use a fast shutter speed of 1/500 or more to freeze the paddler in the image. At night there just isn’t enough light to do that! You have to drop the shutter speed and that makes for blurry images. This can be used to get a certain style of photos, but can look old quite quickly! Camera flashes can also be used to freeze motion. This normally makes images look really flat and two dimensional, as you only have light coming from one direction (and really close to the lens in a point and shoot camera). However, with a dSLR and external flashes, you can be really creative with your lighting! The picture below demonstrates the setup nicely. 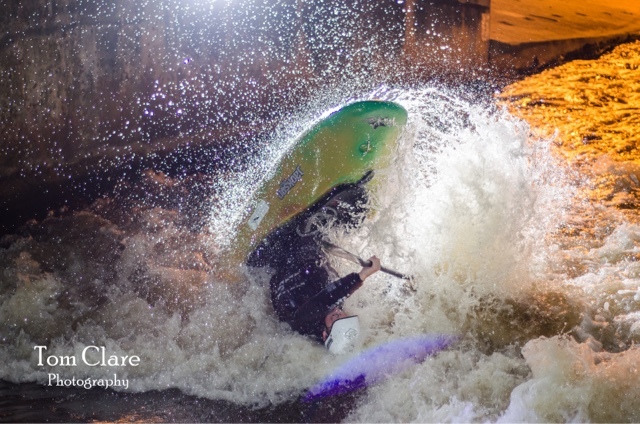 I had a fixed LED light (My head torch duct taped to a tripod) pointed at the hole to allow me to focus. The really bright light is my external flash that was set to fire when the flash on my camera went off. 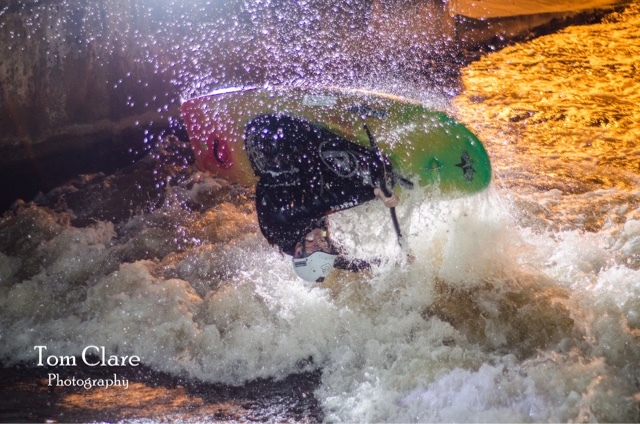 The external flash was positioned behind the paddler in the hole, so any splashed water was really lit up, leading to the effect seen in the photos. 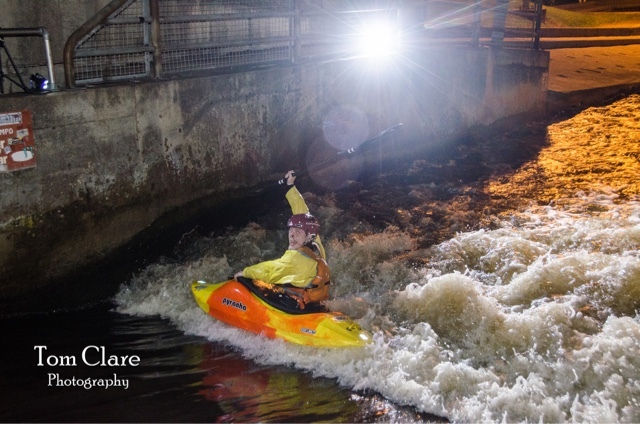 By playing around with the position of the flash relative to where I was taking the photo I was able to get a range of effects, from the halo-like effect to strongly lighting one side of the paddler while leaving another side in darkness. For any camera geeks out there, I shot the photos using a Nikon D7000 with a 50mm prime at 1/60s shutter speed, f/2.8 aperture and ISO 800. I used two external flashes, one Nikon SB910 on my camera at 1/8 power and a yongnou flash on 1/16 slaved to my main flash. 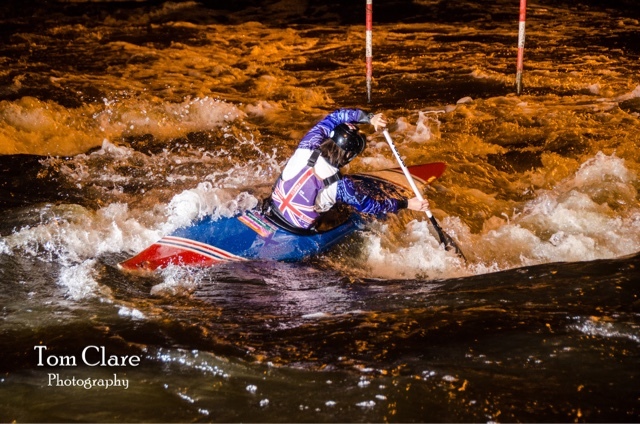 The paddlers in my photos are James ‘Pringle’ Bebbington (former world champ), Jack Gunter, Sam Valman, Rob Crowe (Current British champion) and Ant Mitchell. Get out there and play with your cameras! Good and different looking images are always a sweet way to draw in new people to our sport!